Oil on panel, 32,5 x 24,5 cm. In addition to a number of paintings of riders in South European landscapes, Phillips Wouwerman also enjoyed painting tired hunters and travellers at resting places. 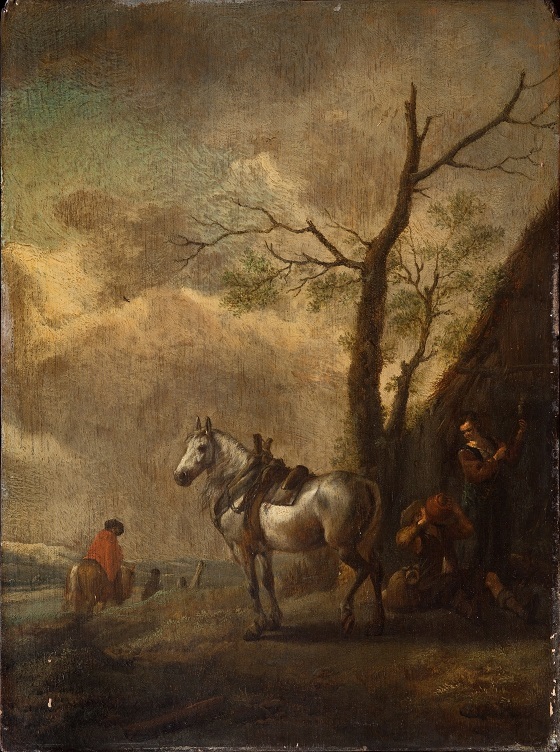 In this painting, the main subject is a saddled white horse by a hut. A man sits on the ground, emptying a mug. In the background a man in red rides off towards the dunes in the distance. It is no coincidence that the white horse is featured as the main subject in this painting. With the fierce competition and often meagre earnings of that time, it was important for Dutch painters to have a consistent and recognisable subject separating them from their competitors. Philips Wouwerman often used a white horse in his paintings as a form of subject signature.